I am a big fan of Chuao Chocolatier's exotic flavors. I'm also awfully fond of World Market. And Summertime. In fact, the only thing I don't like about those three things together is melty messes on my fingers. Yum! 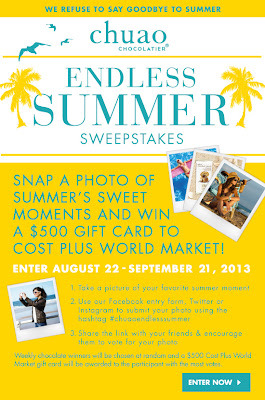 Go enter the Chuao Endless Summer Sweepstakes. In accordance to the FTC Guidelines and the WOMMA Code of Ethics, I am disclosing that I have received product samples from Chuao in the past. No compensation was provided. All opinions are, as usual, entirely my own.